(LISTEN) Rikki Rockett of Poison talks to Mike Z-Wired In The Empire | 96-7 KCAL Rocks! Legendary Poison drummer Rikki Rockett talks to Mike Z. They start off with a health update now that Rikki is cancer free for two years and they talk about the warning signs. Mike Z talks about Rikki inspiring him to pick up drum sticks and Rikki talks about who inspired him to do the same. 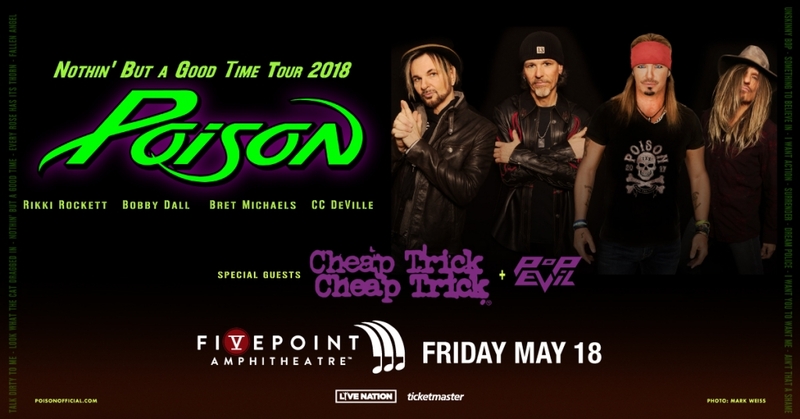 They talk about the Poison tour at FivePoint Amp in Irvine on Friday, May 18 along with Cheap Trick and Pop Evil. They also talk about the classic “Swallow This Live” album from Poison and whether it or not it was actually live. They also geek out about drums and how Rikki plays them and get into Rikki’s other love: Brazilian Jiu Jitsu and what a big UFC fan he is. In closing they talk about Rikki’s other band: Devil City Angels and whether or not Poison will record any new music and what new music Rikki is listening to these days.